Doing Company is a well known name for providing rice bran oil solvent extraction plant. Rice bran is by-product obtained during rice milling operation. To process 100T white rice, you will get about 8T rice bran which is golden reddish cuticle obtained after removal of the husk and during polishing of the rice. Rice bran oil solvent extraction plant can extract 16 to 22% oil in rice bran and this oil is recovered by solvent extraction process. Miscella evaporates and strip according to different boiling points, make solvent vaporize into steam, and seperate with oil, then get crude oil. Solvent steam can be recycling through condensation, cooling. The meal also contains some solvent, it will get dry meal after desolvent and drying, during this process, it will volatilize steam, also can be recyclable through condesation and cooling. 1. 1ton oilseed can consume steamless than 380g. 3. 1ton oilseed can consume recycling cooling water less than 20 ton. 1. Offer customized edible oil solvent extraction process solution according to different oil varieties (soybean, peanut, cottonseed, rapeseed, vegetable seeds…). 2. Ensure the edible oil solvent extraction process is adapted to the production capacity of your enterprise. 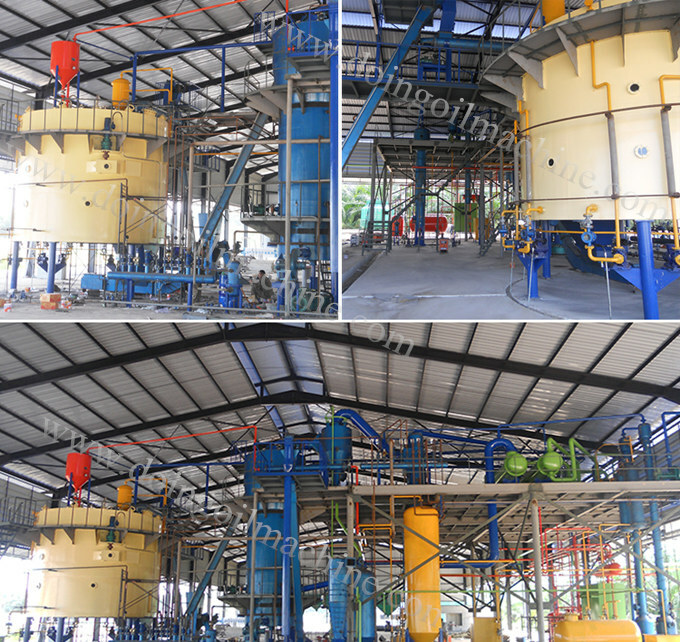 Continuous edible oil solvent extraction process is suggested for production of large capacity, while batch type is more suitable for medium and small edible oil solvent extraction process . 3. Others, such as the reliability of the equipment and technology,labor productivity, theconsumptionrate of auxiliary materials, steam, water and electricity. According to the customer's various conditions, we can provide suitable engineering plan. Layout design for customer's plant, various configurations according to your needs. Rice bran oil is of rich nutrition which contains 80% UFA (unsaturated fatty acid). 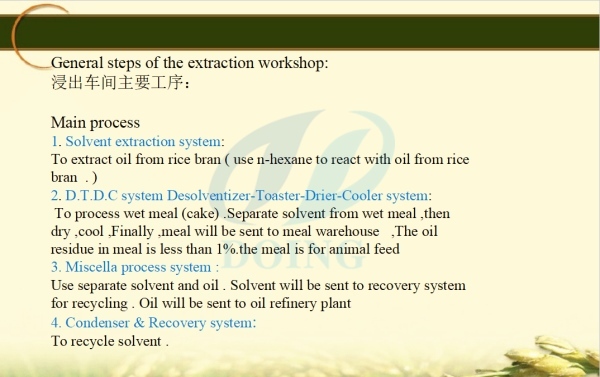 Using rice bran oil solvent extraction plant to extract rice bran oil can get maximum oil yield and get the maximum benefit. Please feel free to contat us! If you wanna to get more details about Rice bran oil solvent extraction plant you can send E-mail to market@doinggroup.com. You can consult our professional engineer and specialized sales team with leave a message in below form.We will contact with you ASAP.You also can visit our factory in Henan,China.Get Detailed address.